I am so happy we are still talking about Custom LED lighted signs because it reminds me of the lighted trumpet decoration we built for a company in Dallas, TX. It is absolutely gorgeous in person. It is one of many instruments we have made. 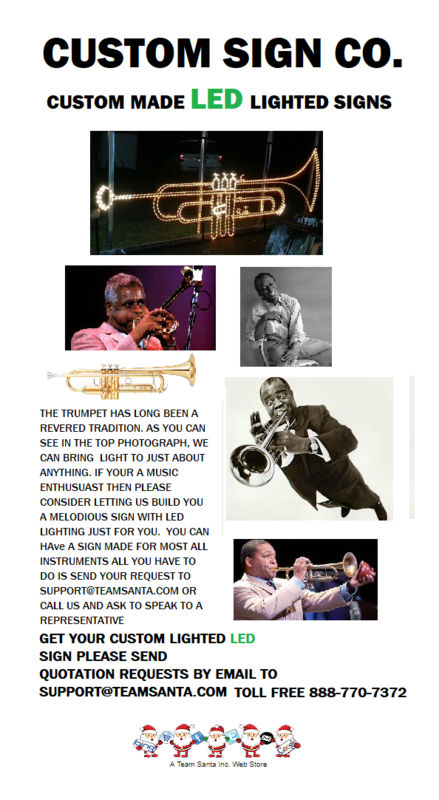 At this time It is being used in the window of jazz club in New Orleans. See the photograph at the top of the page. The lighted trumpet lights up the whole window. Everyone was real happy with the trumpet and it’s still hanging in the window of the jazz club last I heard. Well until the next time we meet, Happy Decorating!